Angostura 5 year Trinidad & Tobago Blended Dark Rum is a popular Rum available from DrinkSupermarket.com in 70cl to buy online. Visit DrinkSupermarket.com for the best price for 70cl of Angostura 5 year Trinidad & Tobago Blended Dark Rum or compare prices on our other Rum products. A blend of light and heavy rums distilled in Angostura's five-column continuous still. The rum is aged in American Oak Bourbon barrels for between five and eight years. After ageing individually the rum is lightly filtered through charcoal to remove impurities, but not so much as to alter the inherently rich flavour or the wood induced, pale amber colours. It is then blended and bottled. This is an energetic and flavourful rum that is exceptionally smooth. It plays an excellent role in a wide array of cocktails, contributing a distinctive taste, attractive colour and delightful aroma to the drink. Angostura 5 yr old has an attractive pale gold hue. It has subtle notes of burnt caramel and vanilla mixed with apple fruitiness. On the palate, it imparts a rich essence of chocolate and spice, with a mellow and smooth mouthfeel and an almost fruitcake-like taste profile. Where to buy Angostura 5 year Trinidad & Tobago Blended Dark Rum ? 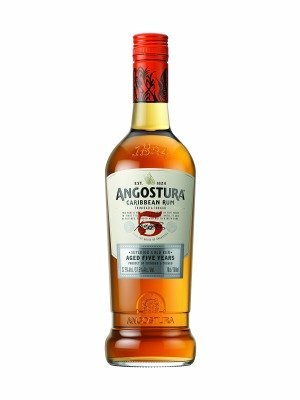 Angostura 5 year Trinidad & Tobago Blended Dark Rum Supermarkets & Stockists. You can buy Angostura 5 year Trinidad & Tobago Blended Dark Rum online in most retailers and find it in the Rum aisle in supermarkets but we found the best deals online for Angostura 5 year Trinidad & Tobago Blended Dark Rum in DrinkSupermarket.com, Amazon.co.uk, TheDrinkShop, and others. Compare the current price of Angostura 5 year Trinidad & Tobago Blended Dark Rum in 70cl size in the table of offers below. Simply click on the button to order Angostura 5 year Trinidad & Tobago Blended Dark Rum online now.